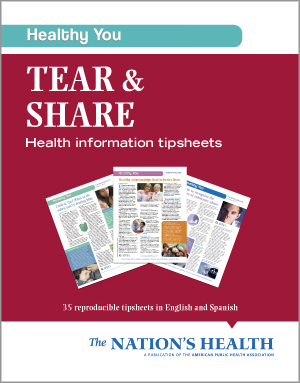 Healthy You Tear & Share: Health Information Tipsheets" is a collection of the most popular topics from Healthy You, consumer-friendly tipsheets that are published in each issue of The Nation's Health. The book gathers 35 topics in English and Spanish from more than 11 years of the award-winning feature's history, including healthy behaviors, infectious disease, prevention, relationships and mental health. The perforated pages of the book can be copied and handed out at health fairs, community meetings or on campus; hung in medical offices or on bulletin boards or dorms; reprinted for community newsletters or church fliers; or shared with family and friends.